My mom has not cared about a comic book since she stopped reading Casper the Friendly Ghost in 1959, but she likes comic book movies because she grew up on a steady diet of B-science fiction flicks. After learning Suicide Squad was about people blowing up monsters and not, as previously assumed, about group suicide, she went and saw it. Afterwards she called to tell me about it. On Saturday. At midnight. It got weird. I’m a fan of the comics, and comics in general. So despite having not seen it I understood some of what she was saying. I knew Will Smith wasn’t playing himself, but Deadshot, and that “scaley guy” was probably Killer Croc, “weird nice girl who whispers a lot” was likely Katana because I hadn’t heard anything about her being a villain, and “handsome long haired guy’s head explodes” was apparently a spoiler about the death of Adam Beach’s Slipknot. But then she started talking about gods and South America and “bumpy cgi monsters who use to be bad guys” and I’ll admit I was a little...confused? So I texted her today for a brand new recap in the hopes it would clarify things. What have I learned? 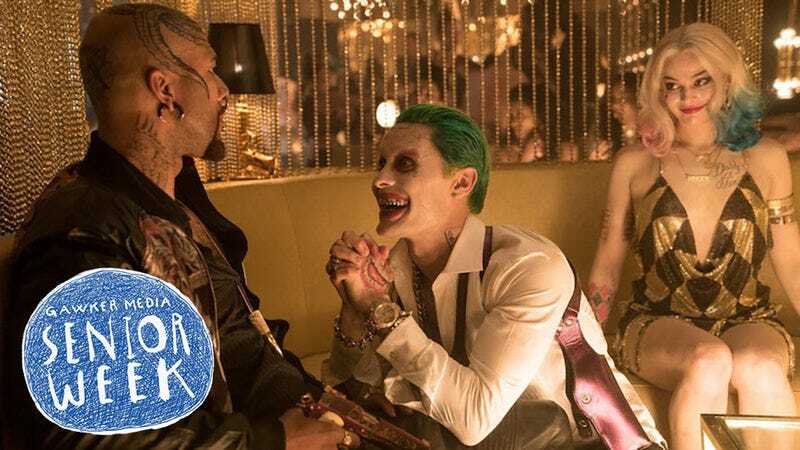 There are a lot of mean people in Suicide Squad. Also gods? I’m still flabbergasted by this gods stuff. This is where we pause because I accidentally asked her to do this in a group chat with my brother. But my mother, a mistress of technology, just hopped right into a private message without preamble. I have no idea what that means, nor did I know that emoji exists. Afterwards, my mother, ever helpful, shot me a quick rundown of the characters—just to help clear things up. She did not clear things up much. Did Harley have a bomb? Did Joker have a bomb? Why is Will Smith so good? Why does Viola Davis have a heart? Why has no one discussed the heart? And why on earth was the big bad for a film about street level villains being forced into redemption by the government a group of South American gods? I’m more confused now than I was at midnight on Saturday.